For more than a handful of years now, both Singapore and India (interesting bedfellows to be sure) have been working closely together to not only bring their two nations into a real partnership, but also to trade ideas back and forth about how to become better nations in their own right. Just recently, Singapore and India have rolled out a brand-new roadmap to help strengthen these ties even more so. Since 1994, these countries have been working closely together as far as national defense has been concerned, and in 2005 they really started to tie together their economic futures with the signing of the Comprehensive Economic Cooperation Agreement – the very first agreement of its kind that India had ever signed with any other country. Both of these countries have been working very, very closely together to find new ways to enrich the relationship, with each country giving far more than they take from the relationship. This has strengthened these two nations in far too many ways to measure, though economists have definitely noticed a significant uptick in the GDP of both these countries since they have started to work together. This new roadmap will lay down the foundation for financial connectivity, new pathways for trade and investment, as well as a variety of cooperative efforts as far as multinational forums are concerned. The Prime Minister of India (Mr. Modi) has spoken at length about how valuable the relationship between his country and Singapore is – even bringing this kind of attention to the United Nations – and has really cemented a rock solid commitment to making sure that the relationship continues to grow as time goes on. Prime Minister Modi was given a ceremonial welcome when he arrived to visit with Singapore President Tony Tan Keng Yam, with a variety of other high level government officials from both nations taking part in the activity. This is pretty typical of the relationship and the welcoming that both great leaders receive from the hosting nation, and is further evidence that these two countries are growing even closer together as time goes on. For more than 50 years, India and Singapore have been working with one another to find ways to establish themselves on the international landscape. Both countries have been able to do exactly that in a variety of different ways, but the economic partnerships – including strategic investments (specially made by Singapore in the infrastructure of India) have really helped to catapult both of these countries further onto the international scene then they may have been able to go separately. 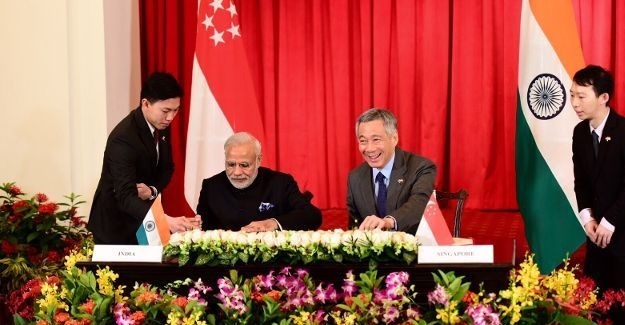 Prime Minister Modi has consistently referred to Singapore as a major partner in the much every area of Indian life, going so far as to proudly announced that he’d like India to model their country (and especially their economic development) almost entirely off of the approach Singapore has enjoyed for 50+ years. The India PM Modi praises Singapore’s investments in India’s infrastructure in particular, and hopes that this relationship is only getting started.